Committed to championing collaborative policy solutions in San Francisco, sf.citi is excited to share our policy developments for 2019. We are thrilled to announce the formation of very own Policy Advisory Committee, as well as our 2019 Policy Agenda. A long time in the making, the sf.citi Policy Advisory Committee will work with the sf.citi team to develop policies that coordinate San Francisco’s tech community around efforts to improve our city. The sf.citi Policy Advisory Committee is made up of seven representatives from different member companies and reports to the sf.citi Board of Directors. We are excited to see how this latest sf.citi addition bolsters our mission of promoting innovation and collaboration to create meaningful change for all San Franciscans. Task one of our Policy Advisory Committee was overseeing sf.citi’s 2019 Policy Agenda. 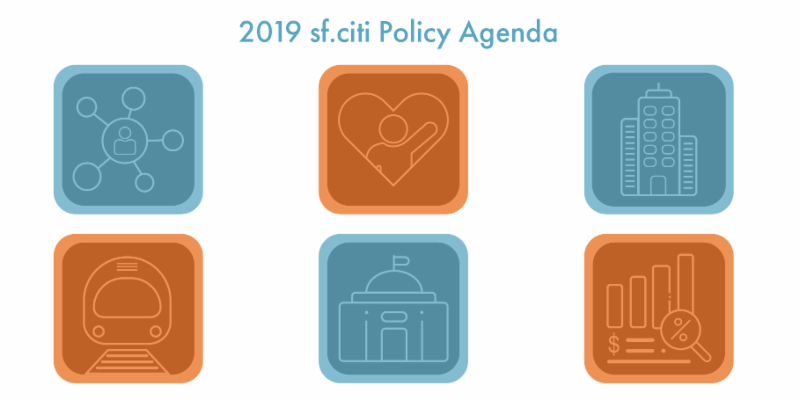 A yearly sf.citi staple, our Policy Agenda lays out the policy areas that matter most to sf.citi and our members. For 2019, we will look at creative ways to increase workforce development, reduce homelessness, grow housing infrastructure, and more. Dive into the specifics below. sf.citi member Facebook hosted Part 2 of our 2019 Lunch and Learn series at its new – and first – San Francisco office with SF Board of Supervisors President Norman Yee and SFPD Chief of Police Bill Scott. The room was packed full with sf.citi members, including Affirm, Alaska Airlines, AT&T, Comcast, Cruise, Goodreads (Amazon), Google, Hustle, Lyft, Microsoft, Salesforce, Twitter, Waymo, Zoox, and more. Up first, President Yee reviewed some of his policy priorities as Board President. Though he graduated from UC Berkeley with a degree in engineering, President Yee has committed the majority of his life to education, teaching elementary students and then at City College. He remains passionate about early childhood education in San Francisco and making the city more accessible to families with children. After becoming District 7 Supervisor, President Yee authored San Francisco’s road safety policy, Vision Zero SF. Looking ahead, he hopes to find new ways to ensure pedestrian and bicyclist safety. Chief Scott continued the discussion with an overview of the San Francisco Police Department’s focus areas, which include public safety, crime reduction, and homelessness. On this latter issue, he told sf.citi members how SFPD is working with a number of other city departments to run the Healthy Streets Operation Center. Aimed at addressing the city’s homelessness problem in a “more collaborative way,” the Healthy Streets Operation Center responds to nonemergency homelessness complaints. All department heads involved in the project, including Chief Scott, meet every two weeks to discuss larger policy concerns around homelessness and street safety. This past Tuesday, the sf.citi team celebrated member company Okta’s community engagement announcements and new San Francisco HQ at the Okta Community Open House. At sf.citi, we strive to show policymakers, community leaders, and tech companies themselves the many ways in which tech can be a powerful force for good in San Francisco and beyond. Our work becomes that much easier when members like Okta set new gold standards in corporate social responsibility. The morning of Okta’s Community Open House, Okta pledged to give $500,000 over the next four years to the Tipping Point Community, an SF-based organization working to eradicate poverty in the Bay Area. Okta’s contribution to Tipping Point is just the start of the company’s long-term community engagement strategy. Okta for Good Executive Director, Erin Baudo Felter, unveiled three other avenues the company is pursuing to give back locally. 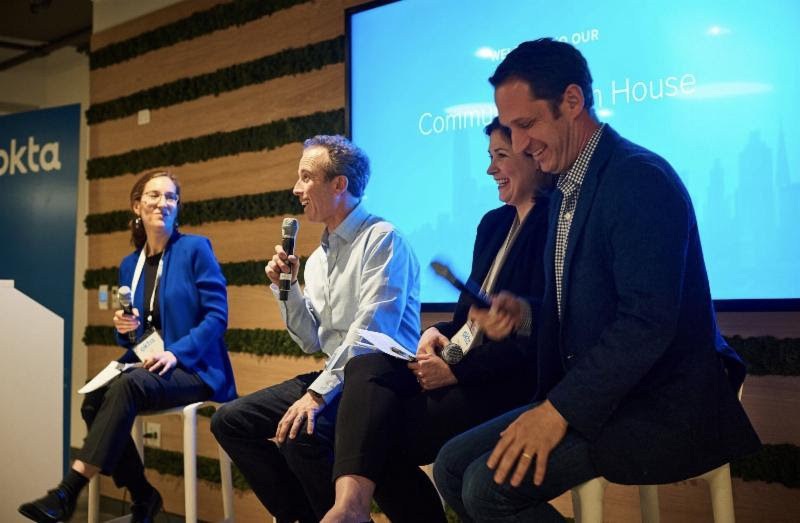 To speak further on how tech can be a strong community partner, Okta assembled an all-star panel of leaders on the topic. Deputy Managing Editor of the San Francisco Business Times, Emily Fancher, sat down with Frederic Kerrest, Okta COO and Co-Founder, Emily Schaffer, Executive Director of Year Up, and Daniel Lurie, CEO of the Tipping Point Community. Learn all about Okta’s Community Open House and community engagement commitments in the latest sf.citi blog! Speaking of companies and orgs doing amazing things, our friends at the Tipping Point Community agreed to invest $5 million in a comprehensive plan to boost jobs and household income in the Bay – more on that here.